Free to Run's third Afghan ultramarathon team is just a few short weeks away from competing in the Gobi March by RacingThePlanet. As an ultrarunner, I'd like to think that I'm pretty tough. I've run hundreds of kilometers in blistering and freezing temperatures, through snow and ice, over mountains, across rivers, and through nights and endless days. But our athletes at Free to Run are continually teaching me what the meaning of tough really is. 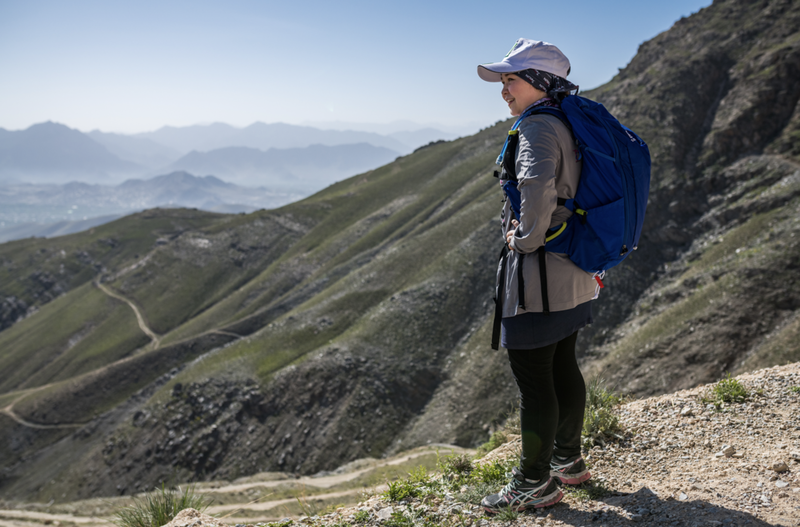 Zeinab and Hasina are currently training for a 250 km self-supported footrace that will take place in Mongolia. They're following in the trailblazing footsteps of Zainab and Nelofar in China in 2015, and Arzoo, Kubra and Mahdi in Sri Lanka in 2016. Each of these ultramarathon teams had to train through insecurity and violence, deal with restrictions on their ability to move safely throughout the city, and brave disapproving stares and comments from those who believe a woman's place is in the home. What makes our 2018 team incredibly unique is that due to the timing of this year's race, Zeinab and Hasina are hitting their peak training time right in the middle of Ramadan. Arzoo and Mahdi competing in the 4 Deserts Sri Lanka, 2016. Ramadan is observed by Muslims around the world who mark the occasion with a month of intense prayer, reflection, and dawn-to-dusk fasting. In Afghanistan, the sun rises around 4:40 am and doesn't set until 7:00 pm, which means that Afghans are rising between 2:30 - 3:00 am to have breakfast before starting their day. It's hard to imagine the physical impact of not having food or water for over 14 hours, every day, for thirty days. Zeinab and Hasina are adding [training for an ultramarathon] on top of that! Amazingly, they have not let this deter them. To date, they’ve completed 15 Ramadan training sessions. They've started to run at night, after 'iftar', which is when Muslims break their fast. "It's a little bit hard because we don't have much energy after fasting," said Zeinab. "But we try our best." Hasina has even started to enjoy the night runs. "It's our first time running at night," she said. "If Kabul had security, we might prefer it, without any stress." Ramadan training has presented many challenges apart from the fatigue and hunger that comes along with fasting. To start, finding safe locations to run at night is twice as difficult. Many of our usual training locations are closed, unable to facilitate, or simply too dark to run. Night practices require extra coordination with security, a constant hurdle in Kabul. At first, Hasina’s family was concerned about the night practices due to the security situation and the limited practice locations. “I had to convince them we are going to a safe place and have safe transportation. But meanwhile I was a little scared myself, because it was late and there were dogs,” said Hasina. Lastly, their fellow Free to Run participants and the staff have made sacrifices in order to turn up, run, and show their support for Hasina and Zeinab. The iftar meal is typically spent in the comfort of family and overflowing plates heaped with food, but their driver and teammates forego the comfort of family and food to sit with them in a bus waiting for sundown to eat a few dates and then run until it’s too dark to see their own feet. It’s this support that has really helped Hasina and Zeinab through Ramadan training. Even if their friends are only walking while they plow through the miles, their presence on the endless loops is the motivation they need to keep going, and sometimes the extra support against the particularly grumpy street dogs. “At first, we thought it would be difficult to run during Ramadan. I remember asking how it could be possible to run the long runs after fasting all day. But, now at the end we really enjoy the night runs,” said Zeinab. Having recently returned to Kabul full-time myself, I can vouch how tough it is here to drag oneself out for a run at the end of the day in this environment - and I'm not even fasting. I had the chance to run 20km with Hasina shortly before the start of Ramadan, and it was her laughter and cheeky attitude that kept me running in circles. I know that both women will bring their energy, positive spirit, and never-give-up attitude to Mongolia and help the other competitors on their way as well. They will undoubtedly face immense challenges during the race... but after seeing what they can do here during Ramadan, I am excited to see what they will be able to accomplish with a few chocolate bars in their pack! We are hugely grateful for the continuous and generous support from 4 Deserts and RacingThePlanet. They have kindly donated the race entries for Zeinab and Hasina, and helped to create this once-in-a-lifetime experience for them. If you would like to help with the other costs associated with their participation in the race (visa costs, training and domestic transportation costs to safe training locations, and flights to/from the race) please visit our Crowdrise page or click the donate button on our website and specify 'Gobi March' in the comments. Thank you so much! And stay tuned for more exciting updates. Reaching the finish line at the 4 Deserts Gobi March in 2015.